Please refer to our stock # R90 when inquiring. 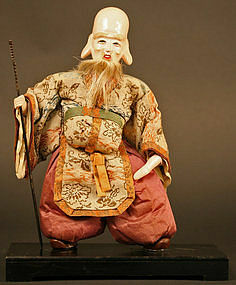 19th Century Japanese Ningyô of Fukurokuju, one of the Seven Lucky Gods. He is the God of Wisdom, Wealth and Longevity. 11 x 7 inches, 28 x 18 cm. Excellent Condition.